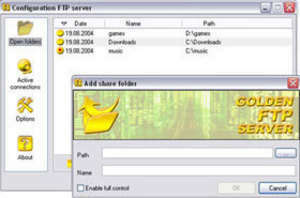 Golden FTP Server is a free personal FTP server for Windows. It is extremely easy to use and can be run by anyone with basic PC skills. The program runs automatically on Windows startup and you can identify the files to share with two mouse clicks via the dialog similar to the standard Windows "Open File…" dialog or via the Windows Explorer context menu. The software features multilingual interface and allows anonymous connections only. Version 5.00 is a freeware program which does not have restrictions and it's free so it doesn't cost anything. For security reasons, you should also check out the Golden FTP server download at LO4D.com which includes virus and malware tests. Additional screenshots of this application download may be available, too.